We’d love your help. Let us know what’s wrong with this preview of My Ishmael by Daniel Quinn. To ask other readers questions about My Ishmael, please sign up. Do you need to read the first book in order to get through this one? Paul Lazzaro No this book stands alone. My Ishmael is, of course, the sequel to Daniel Quinn's novel Ishmael. This book focuses on much the same subject matter as the first book. Namely, that the agricultural revolution gave rise over time to the modern-day Taker culture. With this rise the Taker's put forth the attitude that they were in control of their own destiny and chose to live in a seemingly unnatural way. They decided for themselves to conquer the world without care of the consequences to all other life. Quinn's main assertio My Ishmael is, of course, the sequel to Daniel Quinn's novel Ishmael. This book focuses on much the same subject matter as the first book. Namely, that the agricultural revolution gave rise over time to the modern-day Taker culture. With this rise the Taker's put forth the attitude that they were in control of their own destiny and chose to live in a seemingly unnatural way. They decided for themselves to conquer the world without care of the consequences to all other life. Quinn's main assertion is that mankind (modern Taker culture) needs to find a better way to live lest they totally destroy themselves and do irreparable harm to the rest of the planet. The book's perspective was told as the dialogue between a 12-year-old girl named Julie and the philosopher/gorilla Ishmael. The book is insightful because we see things in their dialogue that answer questions left hanging in the first novel. However, the dialogue itself is very weak and it's hardly believable that a 12-year-old girl is going to have some of the mature conversations she does with Ishmael. In fact, some of the dialogue begins to read like a rant from the writer. One of the more irritable things I found with this book and with Quinn in general is his sitting on the fence attitude. He continually extols the virtue of tribal (aka Leaver) culture while lamenting our own culture. However, when asked specifically if he is saying we should all revert to a more primitive form of living he will say, "no no no you have to find your own way to live." When asked what this own way is he'll respond, "you're an inventive people..so invent!" So much for practical solutions. 1.) Quinn constantly asserts that religion is something the Taker culture had to invent to put forth a myth about how things came to be this way. Also, that only our modern culture would have to of had a myth to explain the downfall of man and a need for prophets to tell us how to live. If these ideas are true why did Stone Age peoples have shamans and have a myth about the downfall of man? Why did New World Indians have medicine men? If prophets are a nonsensical waste of time considering they only inflict their view of how to live on people then what does Quinn consider himself? 2.) If tribal cultures know the way to live which works and have been around for hundreds of thousands of years...what makes Quinn so sure that modern Mother Culture with her inventiveness, ingenuity, and intelligence won't figure it out down the line? 3.) If primitive life was so vastly superior to modern life why the short life-spans of primitive peoples? Could it be that living in that lifestyle was a fairly tough existence where you were not expected to live a long life? Obviously there are many other valid points Quinn makes in the novel. One of them is that our legal system is messed up. Another is that schools aren't really doing that great of a job. None of these points are shockingly original but are well worth considering how to change. There are books that illuminate the world in new ways to us. Rarely have I read a book that sheds light on my own existence the way this book did. It isn't so much that it's a fun read, or even that it's a well written book. The fact is it makes you think. I believe this makes many who read it uncomfortable. It questions the bedrock of our society in ways that aren't easily dismissed. Some people hate this book for that. Others find it hard to read. I think the more deeply rooted in mainstream c There are books that illuminate the world in new ways to us. Rarely have I read a book that sheds light on my own existence the way this book did. It isn't so much that it's a fun read, or even that it's a well written book. The fact is it makes you think. I believe this makes many who read it uncomfortable. It questions the bedrock of our society in ways that aren't easily dismissed. Some people hate this book for that. Others find it hard to read. I think the more deeply rooted in mainstream culture one is, the harder it will be for them to even ask the questions this book gets you to ask. This is why I recommend everyone read this book. I have pestered my mother's book club to no avail, and so I turn to all of you. With all of the negative reviews posted here I felt compelled to counter a bit. This may be a complete waste of time as there are many that see modern civilization as the apex of human development. Some of us disagree, some of us very strongly. I dropped out of High School as a Junior, precisely due to the critiques offered by Ishmael (Quinn). Our current education system serves no other purpose than to produce complacent, docile, and obedient employees. After dropping out of High School I spent With all of the negative reviews posted here I felt compelled to counter a bit. This may be a complete waste of time as there are many that see modern civilization as the apex of human development. Some of us disagree, some of us very strongly. I dropped out of High School as a Junior, precisely due to the critiques offered by Ishmael (Quinn). Our current education system serves no other purpose than to produce complacent, docile, and obedient employees. After dropping out of High School I spent the next few years reading everything from Crowley to Nietzsche to Locke to Yeats. I've been at it ever since, including obtaining degrees in higher education. My master's thesis in many ways mirrored the themes that Ishmael conversed about, and yet I had never read the book. Interesting how some reviewers accuse this book of being for "hippies". If by that you mean people that feel with their hearts as well as think with their heads, then perhaps your assessment may be close. Excessive drug consumption can also help one to clear out all that cultural/social brainwashing that so many hold to as if it were some absolutist dogma handed down from some psychotic, sociopathic god from on high. Sorry folks, it is concocted by people in power to keep the rest of us good little slaves in our places. Whoops, naughty Marxist thinking; yes I'm a political heretic, among things. For those of us who have experienced "homelessness" at some time in our lives, especially if you have spent long periods in wilderness settings, Ishmael's truths hit all the more home. Evolution is only the real "law" at work in this universe. The more we try to live in accordance with our own evolutionary nature the happier we will be. As long as idiots are running the show prohibiting everything good in life and forcing us all to dance to their greedy power hungry tune, with leisure time consisting of sports, news, and sit-coms that portray all men as idiots, all women as conniving divas who merely tolerate men, and children that show no sign of life or independent thought, let alone any respect for their elders. With this paradigm,there will continue to be increased mental illness and overly medicated machines that used to resemble human beings. Young men will continue to slaughter innocents, unhappy women will continue to fill their empty lives with hook-ups, unrealistic expectations, and prostituting themselves in marriages to men with money, and children will see a world without goodness and hope, preferring brutality towards their peers or suicide. It's not that I didn't like this book. I did. But, instead of writing this book in a form which uses dialogue between the characters, Quinn should have simply written a discourse on his beliefs of the world. While his theories and ideas were extremely interesting, the dialogue became tiresome very quickly. I had to put the book aside because, honestly, it started to irritate me. So, Mr. Quinn, if you are reading this, spare us the monotony of boring dialogue and just write a dissertation containi It's not that I didn't like this book. I did. But, instead of writing this book in a form which uses dialogue between the characters, Quinn should have simply written a discourse on his beliefs of the world. While his theories and ideas were extremely interesting, the dialogue became tiresome very quickly. I had to put the book aside because, honestly, it started to irritate me. A hippie grocery store clerk suggested this to me. That should have warned me off right there. From her breathlessly enthusiastic description of a psychic gorilla with The Secrets to Existence, I erroneously thought it would be a playful, Tom Robbins-esque lysergic carnival ride. That is NOT what I got. If this had been written as a pamphlet to be handed out by wide-eyed hippies on street corners, I probably would have considered it to be a more honest work. Instead, we're presented a cardboard cu A hippie grocery store clerk suggested this to me. That should have warned me off right there. From her breathlessly enthusiastic description of a psychic gorilla with The Secrets to Existence, I erroneously thought it would be a playful, Tom Robbins-esque lysergic carnival ride. If this had been written as a pamphlet to be handed out by wide-eyed hippies on street corners, I probably would have considered it to be a more honest work. Instead, we're presented a cardboard cut-out lead character, whose sole duty is to punctuate the talking gorilla's pronouncements with monosyllabic agreements. I might have been swayed by the underlying philosophical bent of the book, but I was having problems with the way the story presented its ideas. However, I was giving it (and the author) the benefit of the doubt, until about halfway through. Then I got to a section where Ishmael (the gorilla) asks the lead character a question. She basically says that she has no idea what the answer might be. Ishmael then gives the Correct Answer, to which she responds, "gee, you're right", and Ishmael continues with his novella-length monologue. What?!? She didn't need to be convinced by a well-constructed argument? He didn't need to give background information to support his claims? Just "I say this is true" and "yes, it is true because you say so"? That's how the whole book seemed to me: "I say this is true, and it is true because I say it is." It was at this precise point that I actively began resenting the book, and by extension, the author. Often it seemed that Quinn was writing this in an attempt not to scare away the non-hippies. "Technology is not the answer. But don't worry, though: you don't need to throw away your VCR. But we shouldn't build any more VCR's." Okay, well, won't those without VCR's wonder why they don't get one? Quinn should have grown some ideological balls, and gone straight into the Luddite, "let's all go live in the woods beside an open-ditch latrine" territory that he was only tiptoeing around. By the end of the book, I was so disgusted with it that when the chick was enlisted to help sneak Ish out of the country, and says to the reader that she won't tell you the excuse they used to convince her mom to let her fly to Africa with possible white slavery merchants, I didn't even flinch. Instead, I just rolled my eyes and thought, yeah, Quinn couldn't figure that out on his own, either, huh? I didn't think I could love a book more than Ishmael, but then I read My Ishmael. This is by far the most important and inspirational book I have ever read. It totally puts a finger on why I have felt so lost in my life and it has become a big influence on how I want to live. The trilogy is written so that Daniel Quinn's ideas can be explained in a story-like fashion through interactions with a different character in each book. Everyone is different, with different upbringings, and different views on life, and so some may relate more to one story than to another. By writing t This is by far the most important and inspirational book I have ever read. It totally puts a finger on why I have felt so lost in my life and it has become a big influence on how I want to live. The trilogy is written so that Daniel Quinn's ideas can be explained in a story-like fashion through interactions with a different character in each book. Everyone is different, with different upbringings, and different views on life, and so some may relate more to one story than to another. By writing three novles Daniel Quinn is trying to reach as many people as possible. More and more of us are realising that something is dreadfully wrong with the way we are living. I've had some amazing conversations since reading these books. And I feel very reassured that there are others out there that feel the same way! Anyone who has spoken to me knows what a huge fan I am of "Ishmael" by Daniel Quinn! This book follows as the next part and surpasses the first one for me because it provided closure which the first one lacked in a way. "There is no one right way to live"
This book continues to expound on the idea of way of life of Tribal communities presenting a worthy alternative to the meaningless existence fostered on this world in the name of civilization. It dissects in detail the way the society is taught t Anyone who has spoken to me knows what a huge fan I am of "Ishmael" by Daniel Quinn! This book follows as the next part and surpasses the first one for me because it provided closure which the first one lacked in a way. This book continues to expound on the idea of way of life of Tribal communities presenting a worthy alternative to the meaningless existence fostered on this world in the name of civilization. It dissects in detail the way the society is taught to believe supremacy of humans whilst ingraining that they are all flawed somehow at the same time. It takes on the establishments and their role in making people believe their imagined shortcomings! Three stars is too much if judging the story and writing, nowhere near enough if judging the ideology and philosophical content. The author should have written a 30 page article instead of stretching his fascinating points about the educational, work-related, political, etc., systems into a long "story" about a talking gorilla who imparts this information to a young girl. It is worth reading one of this author's books to see his philosophical views- in fact, I highly recommend you do- but the st Three stars is too much if judging the story and writing, nowhere near enough if judging the ideology and philosophical content. The author should have written a 30 page article instead of stretching his fascinating points about the educational, work-related, political, etc., systems into a long "story" about a talking gorilla who imparts this information to a young girl. It is worth reading one of this author's books to see his philosophical views- in fact, I highly recommend you do- but the story and dialogue are terrible and I have no inclination to read more by him. I think I "get it," and so should everyone, so read it just to make sure you understand how and why the system stinks. A very clear look into Human history and behavior, and how developed societies compare to primal ones. There are many good points, and Mr. Quinn gives articulation to sentiments I feel many have, but did not know how to voice. Coming from a gorilla is an interesting device. I feel more people are willing to listen to him over a human character. I LOVED this book. The entire book is dialog between two individuals and it portrays such a strong message about the world and what we as humans are doing to it. Very emotional, especially towards the end. Definitely a book that I will always remember and keep in my collection just because it's that special to me. This book changed the way I think about politics. Instead of using the oppressive force of government to change everyone to act according to how I'd like people to act, I now understand it is up to me to find my tribe and help create the world in which I live. This is a story that will change the way you view our educational system and view society as a whole. I wish it was required reading in every high school across the country. It is a book I give as a gift to every student I know when they graduate. Rocked my world. It's like Ishmael, only more so--both books leave me questioning how I want to live in this world, what society should look like, what I can do. The end is sort of a different style than the rest of the book and is somewhat less believable, but still worthy of 5 stars as a whole. Ishmael teaches by telling stories and engaging his pupils in a Socratic dialogue. He wants to lead them through a I think Daniel Quinn has hit upon something very special in his Ishmael books. That special thing is a concept, or way of looking at human history, that tells the story of how people came to be the way they are. Mr. Quinn tells this story through his fictional teacher who seeks students to learn his insights and pass them on. That teacher is a sentient gorilla by the name of Ishmael. Dr. Dunning described Ishmael as “the book that helped her realize that there was a door to another experience”, and I can only tell you that the door is real folks. “My Ishmael” is an opening of that door to a wider, more hopeful future of sustainable human culture. The thought experiments, Socratic dialogue, and contemporary applications left me with a picture of a new earth worth pursuing. Oh yeah, and did I mention this whole thing takes place between a 12 year old girl and a sentient gorill Dr. Dunning described Ishmael as “the book that helped her realize that there was a door to another experience”, and I can only tell you that the door is real folks. Oh yeah, and did I mention this whole thing takes place between a 12 year old girl and a sentient gorilla??? With both the Ishmael books, I appreciated that they at least got me thinking. But I can't say they actually created in me any unique ideas I haven't found in much better written books or come up with myself. I'm 47. Maybe if I had read it as a teen, it might have had more impact on me. I don't know. My Ishmael, in my opinion, is the stronger of the 2 and I liked how it tied into it, the story of the narrator in the first book. However, it bordered on ridiculous over the last few chapters where t With both the Ishmael books, I appreciated that they at least got me thinking. But I can't say they actually created in me any unique ideas I haven't found in much better written books or come up with myself. I'm 47. Maybe if I had read it as a teen, it might have had more impact on me. I don't know. My least favorite of the series. The 12-year old character was difficult to believe. Maybe the point was that what our culture considers a child can be an integral part of a plan. I enjoyed the sections on the economy and education. The digs on prior pupils from the first two books felt unnecessary and not very accepting. Isn't that supposed to be the point of these books? That there isn't just one right way? This review has been hidden because it contains spoilers. To view it, click here. Although the tone was a bit pedantic - just because it's a gorilla lecturing doesn't mean it's fun to be lectured to - the premise was intriguing: If you believe the world was made for humans, then you will inevitably exploit it for human wants. What if the world was made for jellyfish? Or trees? Or king crabs? And humans are just another occupant of the space? Would you that change the way you live, your actions and behaviors? Worth thinking about. I had and did the usual things -- childhood, schools, universities (St. Louis, Vienna, Loyola of Chicago), then embarked on a career in publishing in Chicago. Within a few years I was the head of the Biography & Fine Arts Department of the American Peoples Encyclopedia; when that was subsumed by a larger outfit and moved to New York, I stayed behind and moved into educational publishing, begin I had and did the usual things -- childhood, schools, universities (St. Louis, Vienna, Loyola of Chicago), then embarked on a career in publishing in Chicago. Within a few years I was the head of the Biography & Fine Arts Department of the American Peoples Encyclopedia; when that was subsumed by a larger outfit and moved to New York, I stayed behind and moved into educational publishing, beginning at Science Research Associates (a division of IBM) and ending as Editorial Director of The Society for Vision Education (a division of the Singer Corporation). In 1977 I walked away from SVE and this very successful career when it became clear that I was not going to able to do there what I really wanted to do...which was not entirely clear. A few months later I set my feet on a path that would change my life completely. It was a path made up of books -- or rather versions of a book that, after twelve years, would turn out to be ISHMAEL. The first version, written in 1977-78, called MAN AND ALIEN, didn't turn out to be quite what I wanted, so wrote a second, called THE GENESIS TRANSCRIPT. Like the first version, this didn't satisfy me, so I wrote a third with the same title. THE BOOK OF NAHASH, abandoned unfinished, was the fourth version. When I started writing version five, THE BOOK OF THE DAMNED in 1981, I was sure I'd found the book I was born to write. The versions that came before had been like rainy days with moments of sunshine. THIS was a thunderstorm, and the lines crossed my pages like flashes of lightning. When, after a few thousand words I came to a clear climax, I said, "This MUST be seen," so I put Part One into print. Parts Two and Three followed, and I began searching for the switch that would turn on Part Four... but it just wasn't there. What I'd done was terrific -- and complete in its own way -- but at last I faced the fact that the whole thing just couldn't be done in lightning strikes. And so, on to versions six and seven (both called ANOTHER STORY TO BE IN). I knew I was close, and version eight was it -- the first and only version to be a novel and the first and only version inhabited by a telepathic gorilla named Ishmael. ISHMAEL was a life-changing book. It began by winning the Turner Tomorrow Award, the largest prize ever given to a single literary work. It would come to be read in some 25 languages and used in classrooms from mid-school to graduate school in courses as varied as history philosophy, geography, archaeology, religion, biology, zoology, ecology, anthropology, political science, economics, and sociology. But in 1992, when ISHMAEL was published, I had no idea what I might do next. My readers decided this for me. In letters that arrived by the bushel they demanded to know where this strange book came from, what "made" me write it. To answer these questions I wrote PROVIDENCE: THE STORY OF A FIFTY-YEAR VISION QUEST (1995). But there were even more urgently important questions to be answered, particularly this one: "With ISHMAEL you've undermined the religious beliefs of a lifetime. What am I supposed to replace them with?" I replied to this with THE STORY OF B (1996). The questions (and books) kept coming: Why did Ishmael have to die? 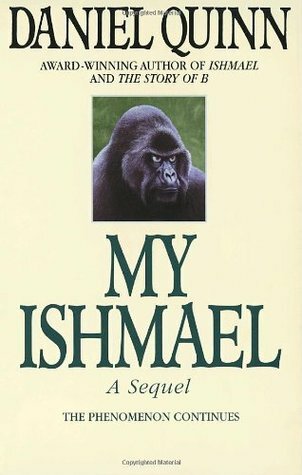 This gave rise to MY ISHMAEL: A SEQUEL (1997), in which it's revealed that Ishmael was not only far from being dead but far from being finished with his work as a teacher. The question "Where do we go from here?" was the inspiration for BEYOND CIVILIZATION: HUMANITY'S NEXT GREAT ADVENTURE (1999), a very different kind of book. With these questions answered (and 500 more on my website), I felt I was fundamentally finished with what might be called my teachings and ready to move on.